Another gorgeous silver ring! 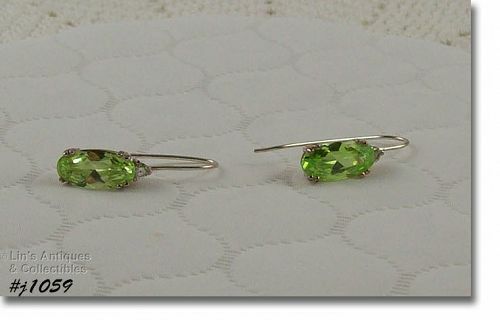 This one is stamped 925, covered with prong-set clear rhinestones (or cubic zirconium or topaz – I really have no idea so I am listing them as the least expensive of the choices which is rhinestone). 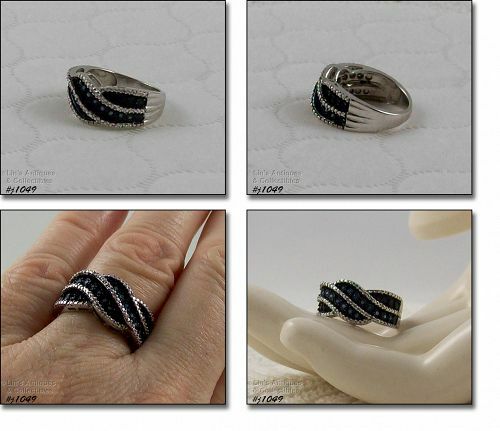 Ring has small marcasite accents. I purchased several silver rings some time ago and this is one of those rings! 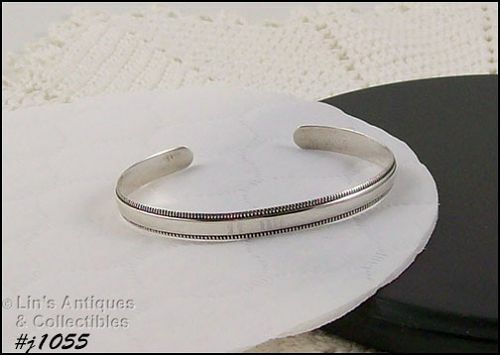 Band is stamped 925 and is made of 3 individual bands of silver that meld into 1 at the bottom (measures 1/4” wide). 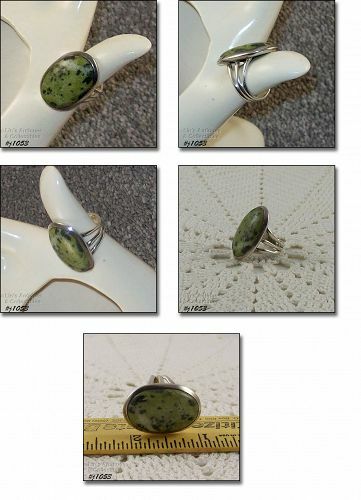 I was told the setting is moss agate – I don’t know but based on the photos I’ve seen on-line, it does appear to be moss agate. The stone measures 1 1/8” x 3/4”. 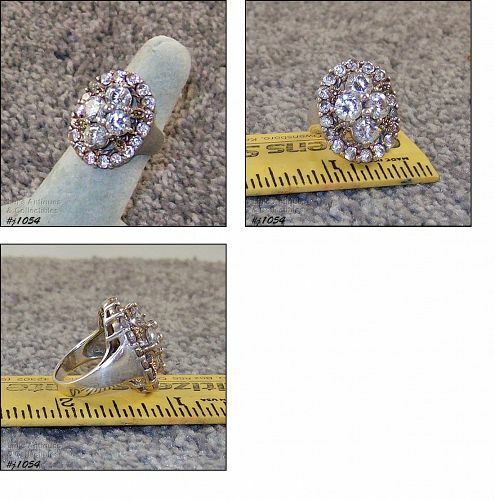 Ring weighs 8.9 grams and is size 7. From my jewelry collection – a beautiful silver ribbon band ring with blue and clear diamonds! Ring has 16 blue diamonds and 6 clear diamonds. It has illusion settings that give the appearance of many more diamonds – in fact, without a loupe or magnifying glass; you can’t tell there are illusion settings! These silver pierced style earrings are so pretty! They’re post style half- hoops, measure 3/4” at wide, and 15/16” diameter. 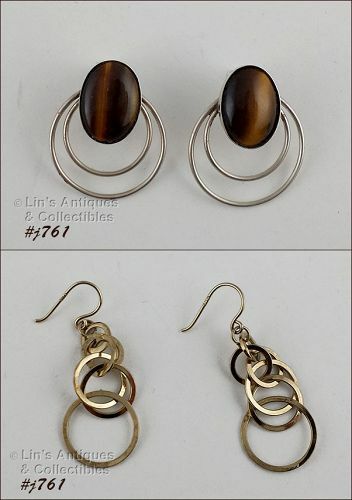 Earrings are marked 925 and have a total weight of 13.1 grams. Another very pretty silver item – this one is a dragonfly pin! 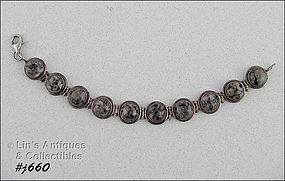 It measures 1 ½” x 1 ½” and is covered with clear rhinestones. Rhinestones appear somewhat darkened in photo -- they are not, it's just the photo. Back of brooch is marked 925 FAS. 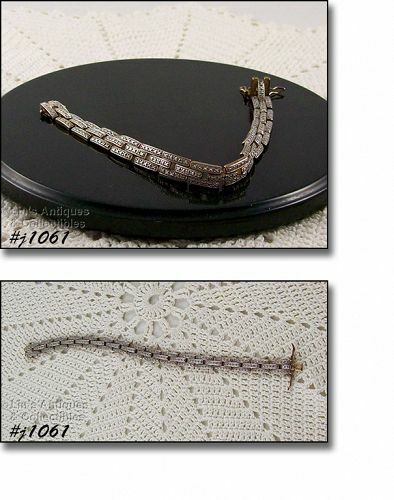 This listing has a gorgeous bracelet that I purchased at a Tennessee antique shop many years ago! 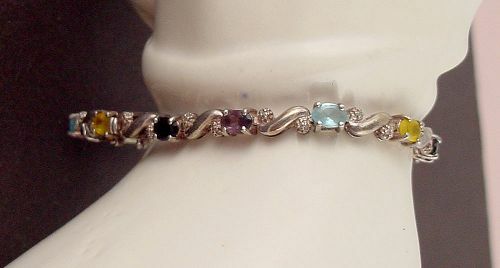 The bracelet is slide style – 2 chains – with 8 heart shaped slides. Between each heart are 2 round silver spacer beads. The fold-over clasp is marked 925 Thailand. When I purchased this bracelet, I was told the hearts were turquoise and black onyx – I have not had this verified by a jeweler but they appear to be turquoise and onyx. All pieces are gold over sterling silver. 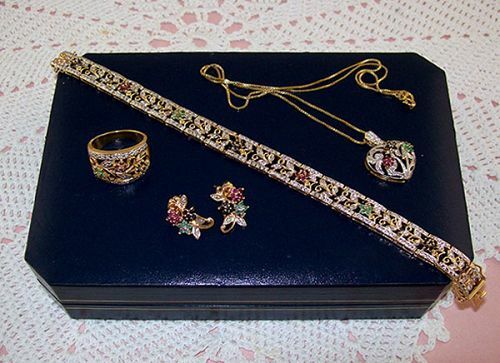 There is a necklace, ring, pierced earrings (post style), and matching bracelet. The pendant including bale is 1” long, ¾” wide, and is marked 925. It is on a spring ring clasp, 18” box chain that is marked JJ, 925, Italy. 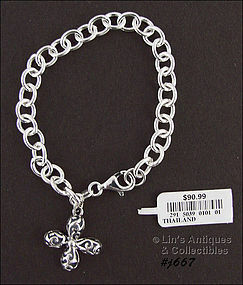 This is a lovely silver charm bracelet with a silver cross charm! The lobster claw clasp is marked 925 as is the cross. 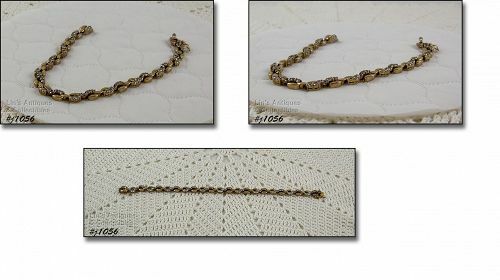 Bracelet measures 7 ½” and per the original tag, the price was $90.99. Very pretty! This is a gorgeous bracelet! 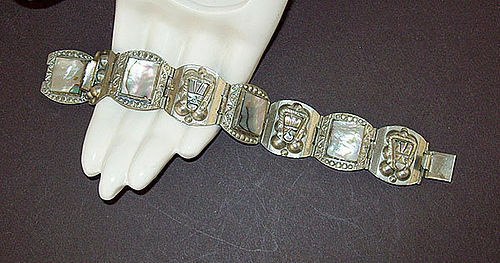 It measures 7” in length, the lobster claw clasp is marked 925, and it is set with agate type stones. I’m not certain what are but they’re pretty – see photo! I’ve grouped these two stick pins into one listing! The heart shaped one is marked Anson, Sterling. The star shaped one is unmarked. 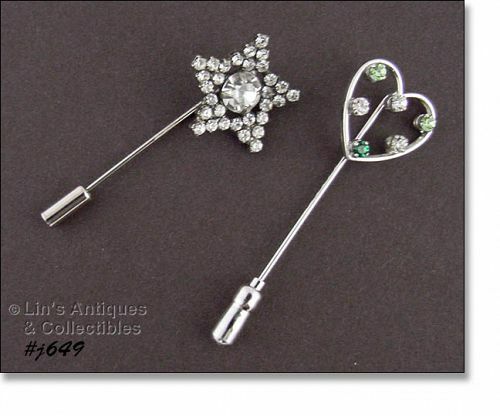 Both pins are very well made with quality rhinestones that are all prong-set. these pins would be lovely worn on a lapel or worn on a hat!